Betty Reid Soskin, 94, is the nation’s oldest National Park Service Ranger and a local icon in her Richmond, California home. But earlier this week, an intruder broke into Soskin’s home, beating and robbing her of several valuables, including a commemorative coin given to her by President Obama. Soskin was able to survive without any fatal injuries, but her face was badly bruised, and elected not to show her face in a sit-down interview with KTVU. “I don’t even like to look at myself in the mirror at this point because I still have a couple black eyes and one is still marked. My lips were split in a couple of places,” Soskin tells KTVU. Around 1:45 a.m. Monday, a man broke into Soskin’s second floor apartment, eventually making his way into her room where she was asleep. Soskin awoke up to a man holding a small flashlight standing near her. She grabbed her cell phone, presumably to call the police, but he fought her for the phone. She was then dragged from the bed through the hallway. “I was terrified. I was terrified. Nothing else I could think of was to scream and scream and scream,” she said. Soskin managed to escape by locking herself in the bathroom, but not before she was struck in the face several times. She was in the bathroom for about 45 minutes and prepared to defend herself with an iron. During this time, the suspect stole her items. 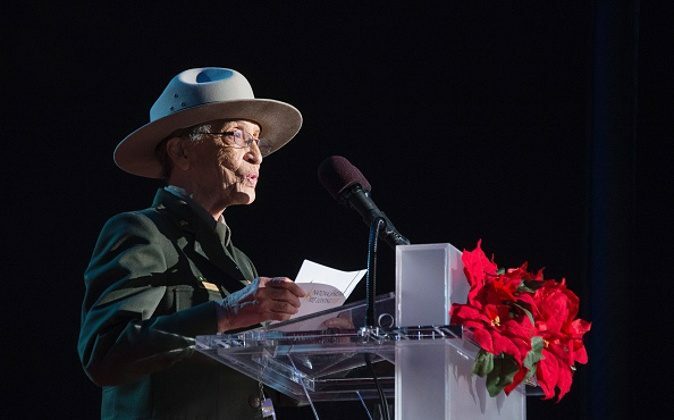 The suspect managed to steal an iPad, laptop, and cellphone, but to Soskin, the value of these items pale in comparison to a commemorative coin given to her by President Obama for being the oldest park ranger in the U.S.
“If I can get that coin back I think I can forgive anything,” added Soskin. Following the attack, Soskin there was an outpouring of support from the community, including an online fundaraiser launched by The Rosie the Riveter park to help compensate for her lost items. President Obama has also reportedly heard about the attack and indicated he will send Soskin another coin. Soskin herself stresses that she’s not a victim, because ultimately she took care of herself, so she has no plans of relocating. “This is my space and it was invaded and I need to reclaim it so I’m going to stay here,” she said. Police describe the suspect as a white male in his early to mid-20s, 5’8″, with a slim build. They urged the community to be on the lookout for anyone trying to trade in an elaborate coin.